50s and 60s recording artist, Jivin’ Gene Bourgeois had several recordings in the top 100 charts in the early 60s. “Breaking Up is Hard to Do,” “Going Out with the Tide,” “Release Me,” and “Go On Go On” are just a few. He has appeared on national TV shows and toured throughout the country with many well known singers and bands. Gene was inducted into the Louisiana Hall of Fame in 1993, the Museum of the Gulf Coast Music Hall of Fame in 1995 and received the Louisiana Hall of Fame Living Legend Award on June 1st, 2003. Gene stopped singing for about eighteen years but never lost the desire for music and singing. In the early 1980s, the 50s & 60s music became popular again and gave Gene the opportunity to perform. He began writing songs in hopes that someone would record them, but no luck. 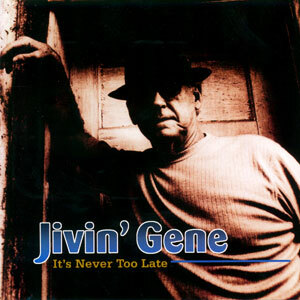 With the encouragement from fellow musicians, friends and family, Gene decided to record the songs he had written and release a Jivin’ Gene album on compact disc. Let’s give some preface here before we start on this review, I have lived a good bit more than half a century, and was listening to late night radio in NYC since I was old enough to sleep in my own bed and have a radio way before little transistor radios let alone iPods. There was a whole world of music out there to be heard, some great country and rock-a-billy on WWVA and lots of gospel, soul, blues, and jazz on WWRL, and those are the 2 stations I remember. Plus you had Alan Freed coming in sometimes from Cleveland, both on the air and then doing Rock & Roll shows in the city, and a whole host of other DJs whose names have faded from my mind. I grew up with Jerry Lee Lewis, Carl Perkins, Elvis, Little Richard, and Fats Domino and that New Orleans sound. I loved that swampy music that just oozed into your pores and made you move. “Breaking Up is Hard to Do,” “Release Me,” and “Go On Go On” are some of the hits at the time that came from Jivin’ Gene Bourgeois. However somehow his name was lost in my memory bank and though I remembered the songs and the voice, but the name wasn’t there, I remembered Jimmy Clanton’s name but not Jivin’ Gene’s. Flash forward a huge hunk of time and on my desk sent was this disc by Jivin’ Gene and though the name rang some bells no picture came through with any clarity. Then it was in the disc player and memories came pouring in, this was Jivin’ Gene and the Jokers of “Breaking Up Is Hard To Do. !” WOW! And the voice is still the same, no rasp of whiskey or cigarettes or any other vocal strain. It almost felt like there had been a time capsule around his voice. Though he gave up singing for almost 2 decades, he never stopped writing songs and what we have here is the new songs and an all-star band that recreates in an organic way the music of those 50s and 60s records. Those wonderful songs that polished up the belt buckles, and drove the chaperones at those dances so many of us attended crazy as they walked around and forced their arms between us and made us separate (at least until they moved on to the next couple). This aggregation is anchored by Gene’s voice, Warren Storm on drums and rubboard (he is Gene’s contemporary) and Ken Marvel on all kinds of keyboards, from piano to Wurlitzer Piano to accordion and more. A fantastic horn section with great arrangements by Doug Deane backs it all up and puts the signature to the music. This is a great one that is well worth searching out.